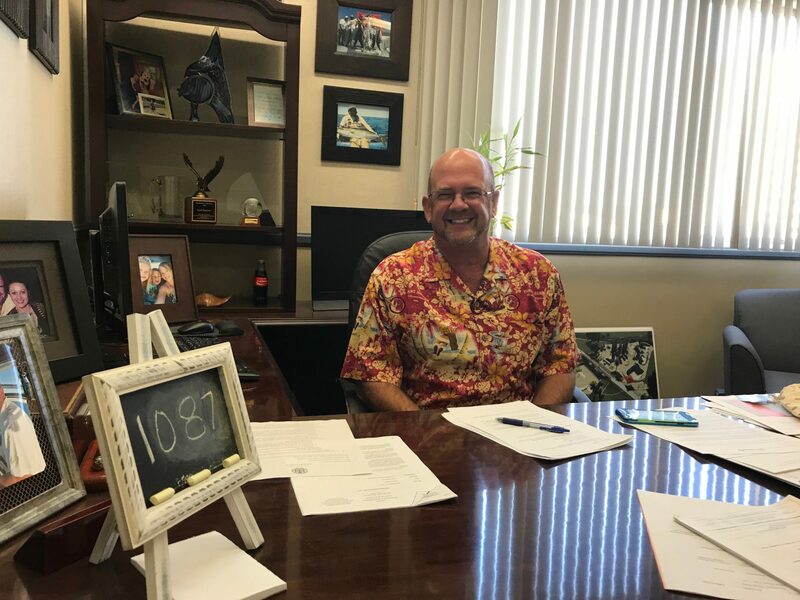 Socialists grapple with housing policy, the Port's chairman (and business community) grapples with a proposal to radically change management of the airport and candidates for county supervisor acknowledge their own cannabis use. Is the taboo over? 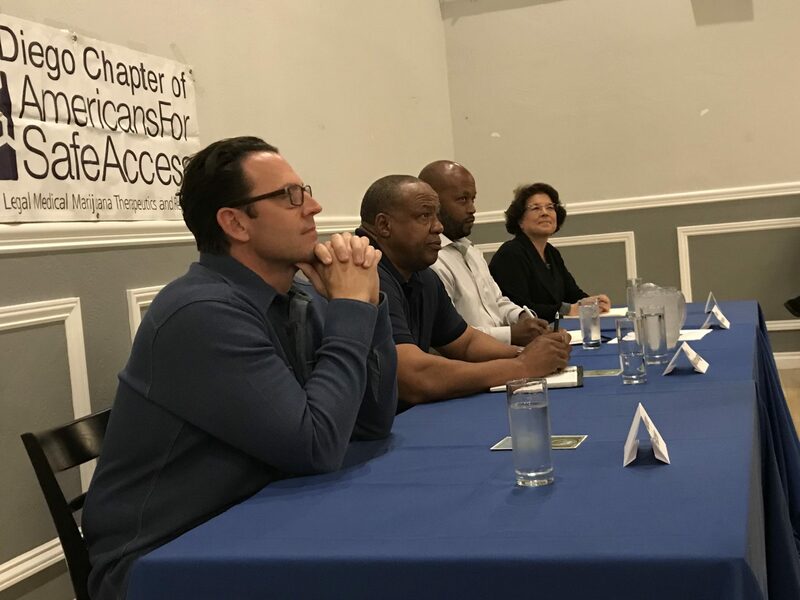 On Tuesday night, candidates for county supervisor District 4 — sans former DA Bonnie Dumanis — gathered for a debate hosted by San Diegans for Safe Access, a group that rallies mostly for medical marijuana infrastructure and permissive regulations. There was not much daylight on policy issues between the four candidates there: Nathan Fletcher, Ken Malbrough, Omar Passons and Lori Saldaña. They all support lifting the county’s ban on cannabis dispensaries and distribution systems in unincorporated areas. All, but one (Malbrough), support regulating delivery services separate from storefronts, if the ban is lifted. All, but one (Passons), support cannabis lounges if a proposal for one comes up. All of them support Genevieve Jones-Wright for district attorney. But the most interesting moment came at the end of the debate, when the candidates were asked about their own experiences with cannabis. Malbrough and Passons both said they had youthful experimentations with the drug. But Saldaña and Fletcher had more contemporaneous experience. I will admit I was late to the cannabis world. I grew up in a very rural, conservative environment where it wasn’t a thing. In college, I was an athlete and we were subject to drug testing and I spent 10 years in the Marine Corps where we were also subject to pretty rigorous drug testing. So I am an infrequent, but occasional user, and I don’t think you have to have this be a part of your daily life to understand why it’s important and to understand why people who are in need and in pain need this in order to just get through the day, and that’s my brothers and sisters who I served with, who I see. The question now: The organizers of the debate said they didn’t even invite Republican Bonnie Dumanis because of her hostility to cannabis. Will her and her team jump on Fletcher’s admission of cannabis use? Would that be good politics? If they don’t attack him for using cannabis, does that mean we have officially seen the taboo fall? As we prepare the next section for you, please enjoy this Twitter exchange between Dumanis’ political consultant, Jason Roe, and Bryan Pease, who is running for City Council in the seat currently held by Lorie Zapf. The question about what to do with the Mission Valley land that once hosted the Chargers continues to cause ruptures in various political coalitions. The news: This week, it was the Lincoln Club. The business-oriented, conservative group’s public affairs committee met to consider endorsements of SoccerCity, SDSU West and the Convention Center expansion. The group recommended that the full Lincoln Club board support the plan to expand the Convention Center and SDSU West, not SoccerCity. The full board could still make a different decision. The debate about SoccerCity got heated. Former San Diego City Manager Jack McGrory represented SDSU West and the anti-SoccerCity forces. They have an ally in Tom Sudberry, a Lincoln Club leader and developer. He’s been adamantly opposed to SoccerCity and helped fund opposition. He’s been a longtime funder of local Republican causes. In fact, Sudberry was City Councilman Scott Sherman’s campaign finance chairman. Things now appear a little tense between the two. At one point in the meeting, Sherman alleged the Lincoln Club would not normally listen to anything McGrory said because he had been responsible for the pension crisis that bedeviled the city for so long and that many Lincoln Club members had themselves spent money resolving with 2012’s Proposition B, to end pensions for future city employees. Sherman hinted that the only reason the Lincoln Club was considering what McGrory had to say was because of Sudberry’s antipathy to SoccerCity. Sherman confirmed to us he said this. Other participants objected to the portrayal of McGrory as the architect of the pension crisis, saying it had actually been former Mayor Susan Golding. Quick review of the history: In the mid-1990s, McGrory, the city manager, came up with the Manager’s Proposal. To free up money the City Council and mayor wanted to use on various projects, the proposal requested that the city’s pension system relieve the city of payments to the pension system. At the same time, employees were offered enhanced pensions, which helped persuade employee representatives on the pension board to support the deal. McGrory would argue that he put in a failsafe: If the pension system’s funding level dropped to a certain point, the city would have to immediately make significant contributions to make it whole. It was essentially borrowing from the pension system. If investments didn’t make up the difference, the city would have to. This is the history Sherman was relying on. “Some people on the committee were insinuating that I was lying, and I figured it was time to part ways,” Sherman said. So he quit the Lincoln Club. Eleven delegates to the state Democratic Party in North County are at risk of expulsion thanks to state party rules against helping non-Democrats in a partisan election. They’ve been accused of signing a petition to get a progressive, though officially independent, candidate on the June primary ballot as lieutenant governor. There’s a good possibility the whole thing will get dropped. In the meantime, the San Diego County Democratic Party central committee is making noise. What’s the big deal? 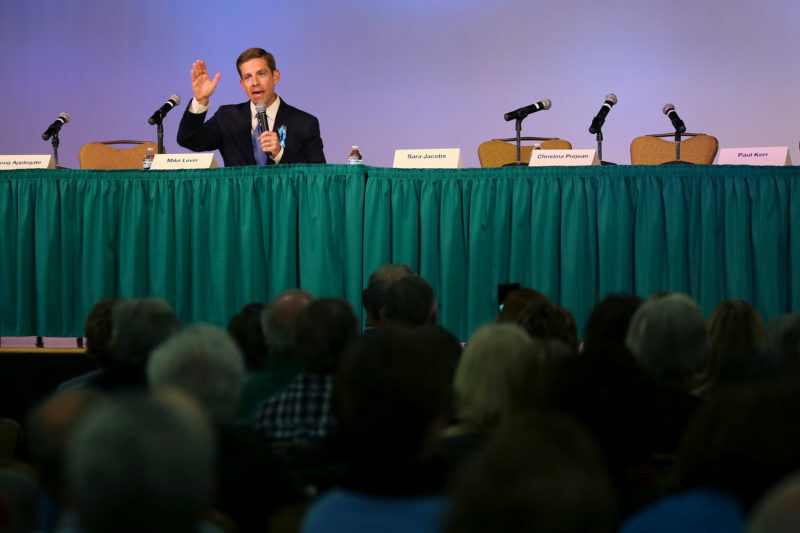 In a memo Wednesday, committee members said 49th Congressional District candidate Mike Levin orchestrated the complaint to boost his chances of securing an endorsement at the state party’s recent convention. The 11 delegates are supporters of Levin’s main competitors, Doug Applegate and Sara Jacobs. The complaint amounted to nothing because it was filed too close to the convention to matter. The delegates voted in any case and Levin came up several votes shy of the state party’s endorsement. When asked for comment about that charge, Skelton didn’t respond. When Assemblywoman Lorena Gonzalez Fletcher introduced a bill to consolidate the Airport Authority into the Port of San Diego, she said it was the start of a conversation the region needed to have. Port Chairman Rafael Castellanos is now eager to host that conversation. In an interview, Castellanos said he would soon talk to Port staff about how the agency consider endorsing or opposing it. The news (he’s into it): “There are a lot of potential benefits of consolidating,” he said. Why: The airport projects millions more passengers in the coming years. The Port is planning for hundreds more hotel rooms on the waterfront. 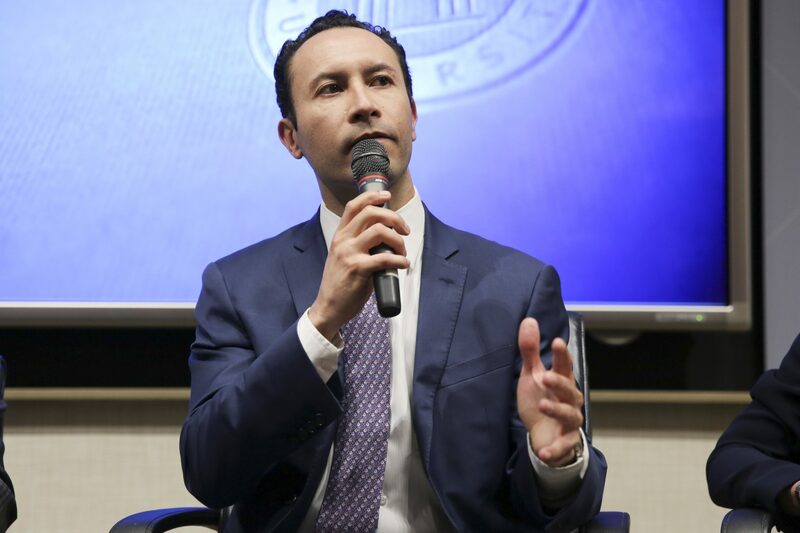 Castellanos said the Port could solve traffic problems, like airports in San Francisco, Portland and Miami, by connecting the airport to the trolley system, since the Port owns not only the airport land, but also the roads that access it. The Airport Authority is good: Castellanos said there isn’t anything the airport is doing – or isn’t doing – that makes him like the idea. “This is really about the future,” he said. At the same time, the region’s business community is beginning to come around to the new conversation, too. For now, it seems unconvinced something needs to change. “Based on our engagement and partnership with numerous organizations throughout the region, I can say that few if any are as responsive, efficient, and effective at what that do as the San Diego Regional Airport Authority,” said Mark Cafferty, CEO of the San Diego Regional Economic Development Council. One of Sacramento’s most watched bills this session is SB 827, state Sen. Scott Wiener’s proposal to override local zoning to allow tall, dense housing development close to transit stations statewide. Last week, the housing and homelessness arm of the local chapter of the Democratic Socialists of America signed on to a statement opposing the bill originally drafted by the group’s Los Angeles chapter. It argues the bill would exacerbate segregation and gentrification, and especially takes aim at the fact that wealthy neighborhoods would not experience the same upzoning as poor neighborhoods. 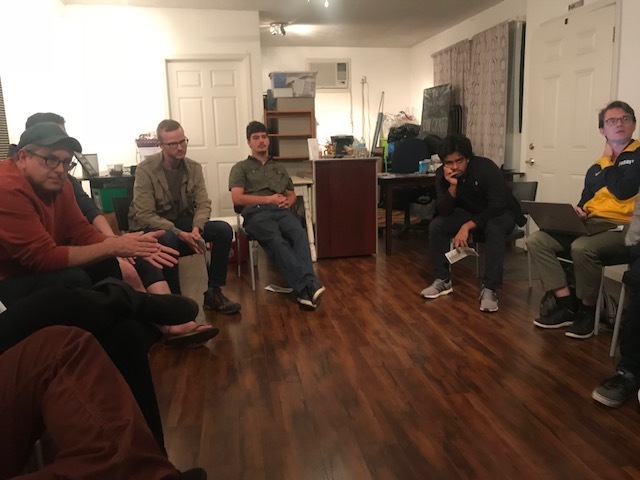 Eleven people — introducing themselves by the pronouns to which they prefer to answer — gathered for the monthly meeting of the local DSA chapter’s subgroup on housing issues Tuesday in San Diego. The DSA isn’t part of the Democratic Party — an independence that lets it support the party’s candidates or causes when they’re aligned, or be openly oppositional when they aren’t, said Jasyn Bracket, the DSA’s treasurer. The group anticipated criticism for opposing the bill and not announcing what it supported, so it discussed getting on board with AB 2372, a bill by Assemblyman Todd Gloria and supported by Councilwoman Georgette Gomez that would give developers incentives to build smaller, cheaper units. They also discussed pushing for SB 827 to mandate that developers pay prevailing wages. They ridiculed the idea that widespread new development could reduce housing prices and that the bill had anything at all to do with discouraging driving and encouraging transit use. The amount of development downtown, they said, was evidence that regulations weren’t meaningfully hurting developers. Makers Quarter: “It’s the type of thing that ought to be opposed,” said a group member who preferred not to see his name in print. One big thing they’re for: Group members are helping collect signatures for a ballot initiative that would repeal the 1995 Costa Hawkins Rental Housing Act, which severely limits local rent control initiatives in California. They don’t trust YIMBYs: It was DSA members who protested the first meeting of the YIMBY Democrats of San Diego County, a group looking to support pro-development candidates and issues on the left. At the meeting, members speculated that the group was developer backed, and remarked that they seemed well-connected to local electeds. But Brackett also said he planned to go to a YIMBY meeting soon to hear them out. DSA has endorsed two candidates this election cycle: Genevieve Jones-Wright for district attorney, and Christian Ramirez for City Council District 8. Got a tip or a meeting you want the Politics Report to check out? Send a note to scott.lewis@voiceofsandiego.org or andrew.keatts@voiceofsandiego.org.